In regions where temperatures remain warm and nutrients are plentiful year-round, species can become specialists, which leads to the abundance of symbiosis that can be observed on tropical reefs. More marine organisms live on Indo-West Pacific (IWP) reefs than anywhere else on Earth. The IWP region covers a significant portion of the planet's surface, ranging from the shores of eastern Africa across the Indian Ocean, the Andaman Sea, the Philippine Sea and much of the tropical Pacific. Within this immense zone lies a unique hub called the Indo-Malayan Triangle, also known as the Coral Triangle. Covering 2 million square miles of ocean, the Coral Triangle includes the diving utopias of the Philippines, Indonesia, Malaysia, New Guinea and the Solomon Islands, and it's where underwater biological diversity reaches its zenith. 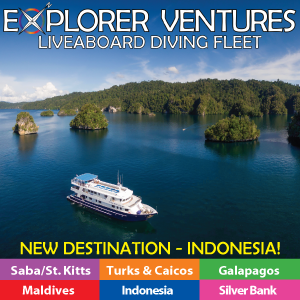 Divers travel the globe to submerge in places such as the clear and colorful Caribbean, New England's shark-filled seas, the eastern Pacific's sinuous kelp forests and the dazzling reefs of the Coral Triangle. Each body of water, each coast and each island, no matter where in the world it lies, has its own particular community of life. This diversity keeps divers roaming from one destination to the next. But what underlies regional differences in marine biodiversity? And why does the Coral Triangle support so much underwater life compared to any other place on Earth? For millennia, warm waters have bathed the Coral Triangle's flourishing reefs with virtually no seasonal temperature variation. Warmth and just the right amount of nutrients allow corals to effectively outcompete algae for space and sunlight, thus providing shelter for innumerable fish and invertebrates. Sea temperature is a major reason for latitudinal variation in diversity of marine life. There is longitudinal variation as well; marine life is generally more concentrated on the western sides of both the Atlantic and Pacific Oceans. In a nutshell, this has to do with oceanic current circulation. Cold, nutrient-filled upwellings generally occur on the eastern sides of these bodies of water, while the western sides have fairly clear, balmy waters. In temperate seas, where algae outgrow corals, organisms must be able to handle seasonal swings in temperature and food sources. Temperate and polar species tend to be ecological generalists, while tropical species can become specialists due to constant temperatures, primary production and plentiful food. Specialization in the tropics leads to a profusion of symbioses. A dive on any healthy IWP reef will reveal dozens of commensal associations: anemonefish living with host anemones, shrimp and gobies, squat lobsters dependent on crinoids for food and shelter, cleaner wrasse ridding fishes of parasites, remoras hitching rides on sharks, and the list goes on. Another factor underpinning the mind-boggling diversity of life in the Coral Triangle lies deep in the past, when sharks were much larger and humans were just a twinkle in the eyes of our primate ancestors. The land and seascape of the Coral Triangle looked very different 50 million years ago, when what are now islands of the southern Philippines, Indonesia, Malaysia and New Guinea were more widely spread across four different tectonic plates. Since that time the Pacific, Indian-Australian, Philippine and Eurasian plates have been thrust together, forming the convoluted conglomeration of thousands of islands and reefs that is the Coral Triangle. Fish and invertebrates that evolved in separate habitats, originally far from one another, have amassed in what is known as a biogeographic sink. The great number and diversity of marine habitats and environmental conditions make for an area that attracts species. The Coral Triangle can be viewed not only as a place where species have aggregated but also as a source of marine biodiversity. Some marine biologists point to evidence that the Coral Triangle is where many reef species originated before proliferating across the planet's seas. "Concepts of the Indo-Malayan area as a cradle of diversification or as a museum for species that originated elsewhere are not mutually exclusive propositions," said Gustav Paulay, Ph.D., of the Florida Museum of Natural History, "nor are they the only ones." While the Earth's tectonic plates have been in constant movement, sea levels have risen and fallen during periods of cooling and warming, forming and razing barriers to fish and invertebrate dispersal through the oceans. When sea levels fall, these intermittent barriers, such as land bridges between islands, ultimately lead to new species evolving through what is known as allopatric speciation. This is the most common means of species creation; it occurs when a population that is geographically separated and genetically isolated from its ancestors eventually adapts to its slightly different environment due to random beneficial genetic mutations that arise in the course of sexual reproduction. This process explains how one fish or invertebrate might evolve into two or more species over time. As sea levels rise and land barriers are once again covered with water, expanding marine habitats allow the now genetically dissimilar populations to mix again. Thus, climatic events in combination with tectonic movements have caused previously isolated species to evolve, congregate in and disperse from the Coral Triangle. Geography, climate, plate tectonics, recurring ice ages and oceanic current circulation play large roles in species' aggregation in and dispersal from given regions, but another vital factor in determining a place's biomass and biodiversity is the number of habitats and niches available. The more habitats and niches, the more species an area will have. For example, the cold, coastal waters of Cape Cod, Mass., offer few habitat differences, while the seascape among the islands of Indonesia offers many. Flooded by daily tides, extensive mangrove forests support juvenile fishes. Seagrass meadows also act as nurseries for a large number of reef dwellers. Nearby lagoons offer protected patch reefs as habitats for large reef fishes. The three-dimensional, honeycomb structure of barrier reefs adds even more niches. Marine biogeography — the wild array and distribution of underwater life — is a vital ingredient in making recreational diving the adventure that it is. Each time divers venture beneath the surface, no matter where in the world, they have the opportunity to observe a creature, a behavior or a relationship that they never seen — and perhaps one that no one has ever seen. It is now estimated that there are roughly 8.7 million species on Earth. Somewhere between 35,000 and 60,000 reef dwellers have been described to science, including many, but certainly not all, shallow-water fish and invertebrates. At present, about 76 percent of the world's coral species and 37 percent of all reef fishes, an estimated 3,000 species in all, flourish within the Coral Triangle. Beyond simply keeping divers fascinated, this biodiversity is a vital cog in the interconnected ecosystems of planet Earth. Every species and individual plays a role, and humans cannot separate themselves from this interconnectedness. "Our understanding of the origin of diversity and distributional patterns in the Indo-West Pacific is still rudimentary," Paulay said. So far it has been impossible to unravel the mysteries and explain all the reasons underlying coral reef life. Besides a handful of well-studied fish and invertebrates, most coral reef dwellers are not well understood because of the difficulties in studying them. It is clear no single explanation for the distribution of plants and animals will suffice — a variety of complicated processes are at work, and they create a plethora of unique diving situations around the world. One of the most captivating aspects of this planet is that life, which is constantly and continually evolving, is unevenly distributed. The observable variability of species that inhabit each diving destination is what drives recreational diving around the world. It's a big part of what keeps divers enduring long travels across the globe — the will to be in the midst of flourishing and ever-evolving life, discovering just a bit more about the unknown, no matter how far we must go.